A sweet old lady, Miss Bendor Samuel, taught me English grammar. I had not gone to see her for grammar lessons (I had attended a Grammar School, for goodness’ sake! ); I was trying to learn New Testament Greek. “You will never learn Greek grammar” she would say “until you learn some English!”, and although she was a short, slight and elderly lady, Miss Bendor Samuel was not one to be messed with! Since then, I have been known to be something of a pedant when it comes to what we see written and what people say. I used to enjoy it when one of the leaders in my first church welcomed people to the service and then helpfully instructed them by saying “if you’re new here the toilets are in the back rooms.” It always left me wondering where the toilets were located for the rest of us. Or another time, in the church newsletter, when someone had written, “Please pray for Mrs So-and-so who’s had her leg amputated and her family.” Just how do you go about getting your family amputated, I mused. One more – this time in Beeding, outside the Newsagents – a headline from the Argus – “Steyning Grammer improve exam results”. Not in spelling, it seems. All this is by way of my HERE, HERE! to the so-called Apostrophiser – a Grammar vigilante who has been ‘terrorising’ Bristol correcting punctuation on signs – removing unnecessary apostrophes and adding missing ones as well. It is great that someone cares so much that, for the past thirteen years, this Banksy of the Grammar world has been anonymously putting wrongs right! I applaud him! OK, so correcting signs is not the most significant service to mankind we have ever heard of, and you might be thinking, so what? I just like it that someone cares enough to do something they believe in, and it drives them to action. Especially when, in other news, we hear of how twenty bystanders watched while a teenage immigrant was brutally beaten up in Croydon. No-one did anything. As we step into Holy Week, or Passion Week, or the week-before-Easter we are mindful that God was so moved by the plight of humankind that he actually did something. He draws to himself all the hate and sin and fallenness and lostness – all the worst the spiritual realms and powers could throw at him- into himself, like a spiritual lightning rod on Calvary’s tree. We hear it so often, we can be a bit like bystanders rather than participators in the story. St Paul tells the Corinthians that it is of first importance that Christ died for our sins. This is not some passing bit of information (“oh, by the way…”), or something that you might get to one day on your faith journey – this is of central importance. You can make sense of a sentence if the apostrophes’ in the wrong place (it might annoy you, but youl’l live) but living without the freedom that the death and resurrection of Jesus brings has eternal significance. It changes everything. As we go through life, it is easy to let the unimportant dominate our lives – to major on the minors. In Christ, God has shown us that His love has no limits. He identifies with us, becomes one of us, and brings us Home once again. 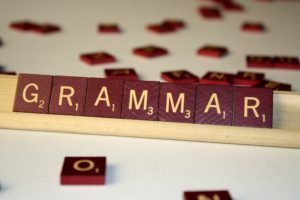 If correcting grammar floats your boat, correct away (I’ve given you some candidates above!) Or it may be other things that grab our attention. But let us not lose sight of what is of first importance and the place it has in our lives. 1 Corinthians 15.3-4 I passed on to you what was most important and what had also been passed on to me. Christ died for our sins, just as the Scriptures said. He was buried, and he was raised from the dead on the third day, just as the Scriptures said.